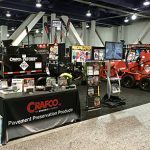 Crafco Asphalt Primer is a specifically-formulated, solvent-based asphalt primer that is used to improve the adhesion of asphalt products to various surfaces, including asphalt concrete, Portland cement concrete, wood, and metal. The primer is applied to the surface at the correct application rate, and then allowed to cure, prior to the installation of the asphaltic product which will adhere to the surface. Typical uses include improving adhesion of asphaltic plug joints, self-adhesive membranes, and hot-applied patching materials. The primer penetrates the surface, binds loose dust and other particulates, and cures to a hard, well-bonded surface. Crafco TechCrete Primer is an acrylic emulsion primer for concrete. It is used as a bonding agent and primer prior to the application of Crafco TechCrete repair mastic. 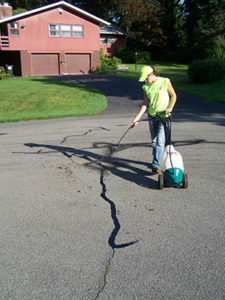 It can be used on smooth, dense, or porous concrete surfaces. 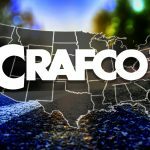 Crafco Pavement Joint Adhesive reduces crack formation and raveling cold joints. 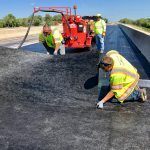 Crafco’s hot-applied modified asphalt composition effectively bonds paving passes together creating a watertight seal during thermal movement resulting in improved long-term performance of the joint with no significant cracking. This product is also effective for waterproofing exposed edges of asphalt concrete pavement areas such as at the curb gutter, and shoulder interfaces. Additionally, waterproofing can be assured where manhole covers and hand valves (gas, water, etc.) are installed in asphalt concrete pavement. Like other Crafco products this product is easy to apply using Crafco’s Melter/Applicator equipment. 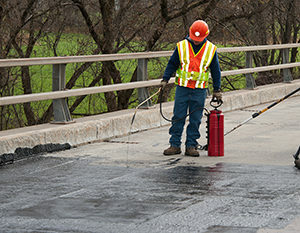 This sealant is a hot-applied bituminous material which, when properly used and applied, bonds markers and reflectors to both asphalt and concrete pavement surfaces. The adhesive is supplied as an easy to use single component material which is easily melted and poured or pumped onto pavement surfaces. Since it is a hot melt composition, the adhesive sets up on cooling and is ready for traffic in less than 5 minutes. Heating can be performed in either directly or indirectly heated melting units. The adhesive contains no rubber polymers which can degrade at application temperature. 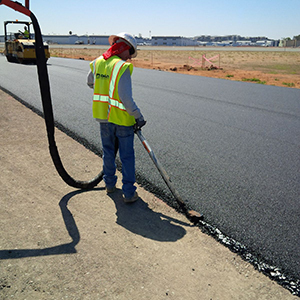 This sealant is a hot-applied thermoplastic bituminous material which, when properly used and applied, bonds markers and reflectors to both asphalt and concrete pavement surfaces. Hot-Applied Flexible Pavement Marker Adhesive is supplied as an easy to use single component material which is easily melted and poured or pumped onto pavement surfaces. Since it is a hot melt composition, Hot-Applied Flexible Marker Adhesive sets up on cooling and is ready for traffic in less than five minutes. Hot-Applied Flexible Marker Adhesive is formulated with premium asphalt, polymers and additives to produce a unique material which hold markers in place and remain flexible at temperatures down to 20°F (-7°C). DeTack is supplied ready to use in 5 gallon (19L) plastic pails. To use, DeTack is poured into typical hand pump pressurized garden sprayers. The spray pattern should be adjusted to a medium fan. DeTack can be applied to the sealant immediately after sealant is placed, or at any time after sealant is placed when surface tack is present. Usage rate of DeTack is typically 1 gallon (3.8L) per 1000-2000 feet (305-610m) of sealed cracks. DeTack should be applied to cover the sealant surface with minimal excess of application onto the pavement surface. The use of this product in no way supersedes the warnings and instructions furnished with the sealant used. Follow Application Instructions on the product container prior to use. DeTack is a water based product and should not be exposed to freezing temperatures. DeTack saves money, time and increases efficiency. No need to wait until the sealant has cooled before opening the pavement to traffic. Use DeTack in place of sand or silly toilet paper to reduce traffic control issues, shorten lane closure and wait time. DeTack is an economical, biodegradable liquid that eliminates the surface tack on freshly applied hot pour sealants. A one-man operation, with a quick spray of DeTack your pavement is ready for traffic. If you’re stuck for an economical, time saving, detackifying solution then DeTack from Crafco is your answer.